While the Occupy movement has forced a public discussion of extreme corporate influence on every aspect of our lives, behind closed doors corporate America is implementing a stealth strategy to formalize its rule in a truly horrifying manner. The mechanism is the Trans-Pacific Partnership. Negotiations have been conducted in extreme secrecy, so you are in good company if you have never heard of it. But the thirteenth round of negotiations between the United States and eight Pacific Rim nations will be held in San Diego in early July. The TPP has been cleverly misbranded as a trade agreement (yawn) by its corporate boosters. As a result, since George W. Bush initiated negotiations in 2008, it has cruised along under the radar. The Obama administration initially paused the talks, ostensibly to develop a new approach compatible with candidate Obama’s pledges to replace the old NAFTA-based trade model. But by late 2009, talks restarted just where Bush had left off. Since then, US negotiators have proposed new rights for Big Pharma and pushed into the text aspects of the Stop Online Piracy Act, which would limit Internet freedom, despite the derailing of SOPA in Congress earlier this year thanks to public activism. In June a text of the TPP investment chapter was leaked, revealing that US negotiators are even pushing to expand NAFTA’s notorious corporate tribunals, which have been used to attack domestic public interest laws. Think of the TPP as a stealthy delivery mechanism for policies that could not survive public scrutiny. Indeed, only two of the twenty-six chapters of this corporate Trojan horse cover traditional trade matters. The rest embody the most florid dreams of the 1 percent—grandiose new rights and privileges for corporations and permanent constraints on government regulation. They include new investor safeguards to ease job offshoring and assert control over natural resources, and severely limit the regulation of financial services, land use, food safety, natural resources, energy, tobacco, healthcare and more. The stakes are extremely high, because the TPP may well be the last “trade” agreement Washington negotiates. This is because if it’s completed, the TPP would remain open for any other country to join. In May US Trade Representative Ron Kirk said he “would love nothing more” than to have China join. In June Mexico and Canada entered the process, creating a NAFTA on steroids, with most of Asia to boot. Failure to conform domestic laws to the rules would subject countries to lawsuits before TPP tribunals empowered to authorize trade sanctions against member countries. The leaked investment chapter also shows that the TPP would expand the parallel legal system included in NAFTA. Called Investor-State Dispute Resolution, it empowers corporations to sue governments—outside their domestic court systems—over any action the corporations believe undermines their expected future profits or rights under the pact. Three-person international tribunals of attorneys from the private sector would hear these cases. The lawyers rotate between serving as “judges”—empowered to order governments to pay corporations unlimited amounts in fines—and representing the corporations that use this system to raid government treasuries. The NAFTA version of this scheme has forced governments to pay more than $350 million to corporations after suits against toxic bans, land-use policies, forestry rules and more. The slight mainstream media coverage the TPP has received repeats the usual mantra: it’s a free-trade pact that will expand US exports. But trade is the least of it. The United States already has free-trade agreements that eliminated tariffs with most TPP countries, which highlights the fact that the TPP is mainly about new corporate rights, not trade. Besides, under past free-trade agreements, US export growth to partner countries is half as much as to countries with which we do not have such agreements. Since NAFTA and similar pacts went into effect, the United States has been slammed by a massive trade deficit, which has cost more than 5 million jobs and led to the loss of more than 50,000 manufacturing plants. How could something this extreme have gotten so far? The process has been shockingly secretive. 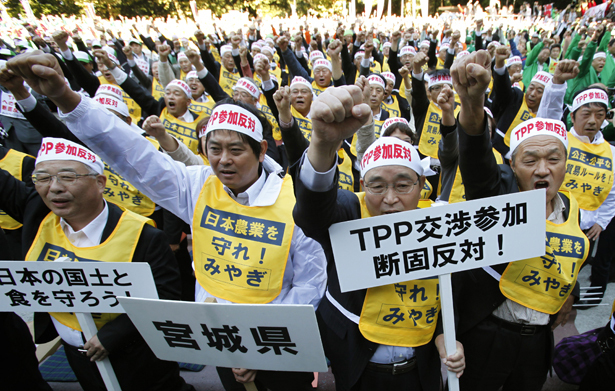 In 2010 TPP countries agreed not to release negotiating texts until four years after a deal was done or abandoned. Even the World Trade Organization, hardly a paragon of transparency, releases draft negotiating texts. This means that although the TPP could rewrite vast swaths of domestic policy affecting every aspect of our lives, the public, press and Congress are locked out. Astoundingly, Senator Ron Wyden, chair of the Senate committee with official jurisdiction over TPP, has been denied access even to US proposals to the negotiations. But 600 corporate representatives serving as official US trade advisers have full access to TPP texts and a special role in negotiations. When challenged about the conflict with the Obama administration’s touted commitment to transparency, Trade Representative Kirk noted that after the release of the Free Trade Area of the Americas (FTAA) text in 2001, that deal could not be completed. In other words, the official in charge of the TPP says the only way to complete the deal is to keep it secret from the people who would have to live with the results. The goal was to complete the TPP this year. Thankfully, opposition by some countries to the most extreme corporate demands has slowed negotiations. Australia has announced it will not submit to the parallel corporate court system, and it and New Zealand have rejected a US proposal to allow pharmaceutical companies to challenge their government medicine formularies’ pricing decisions, which have managed to keep their drug costs much lower than in the United States. Every country has rejected the US proposal to extend drug patent monopolies. This text was leaked, allowing government health officials and activists in all the countries to fight back. Many countries have also rejected a US proposal that would forbid countries from using capital controls, taxes or other macro-prudential measures to limit the destructive power of financial speculators. However, we face a race against time—much of the TPP text has been agreed on. Will the banksters, Big Pharma, Big Oil, agribusiness, tobacco multinationals and the other usual suspects get away with this massive assault on democracy? Will the public wake up to this threat and fight back, demanding either a fair deal or no deal? The Doha Round of WTO expansion, the FTAA and other corporate attacks via “trade” agreements were successfully derailed when citizens around the world took action to hold their governments accountable. Certainly in an election year, we are well poised to turn around the TPP as well. To learn more and get involved, go to tpp2012.com. Lori WallachLori Wallach is the director of Public Citizen’s Global Trade Watch.